He's walked out and she still wants him back. Thousands of discouraged and hurting women ask, "Is there anything I can do to win my husband back?" Though there are plenty of books on divorce, few talk about what it takes to initiate a reconciliation. 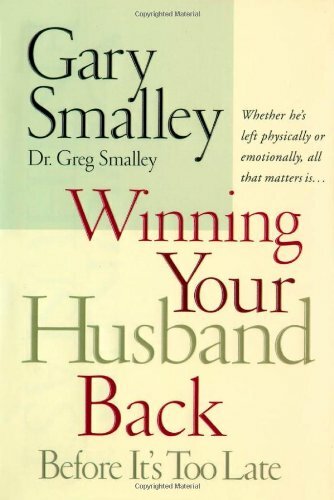 Gary Smalley and Dr. Greg Smalley offer women a biblically based strategy for winning back their mate. Included is an appendix of additional resources on organizations, counseling centers, video series, and books that have proven particularly helpful in this situation. Full of practical advice and realistic encouragement, Winning Your Husband Back can help heal a marriage. And whether the marriage is healed or not, the ideas will also help readers become responsible for their own choices and draw nearer to God. 1. Winning Your Husband Back Before It's Too Late: Whether He's Left Physically or Emotionally, All That Matters Is. 2. Winning Your Husband Back Before It's Too Late: Whether He's Left Physically or Emotionally, All That Matters Is. 3. Winning Your Husband Back Before It's Too Late: Whether He's Left Physically or Emotionally, All That Matters Is. 7. Winning Your Husband Back Before It's Too Late: Whether He's Left Physically or Emotionally, All That Matters Is.